Marcia was getting dizzy and lightheaded and we were worried it was her blood pressure medication but her BP was normal so we ignored it and it has dissipated some. It was a sense of relief hitting the freeway out of Porto at 3 PM. Really. As we got to the outskirts (which didn't look much better), my whole mood improved. We drove south and then west to the coast for the 45 mile drive (Marcia) to the city of Aveiro (ah-vay-ee-row) which sits on a reclaimed lagoon with waterways similar to Ft. Lauderdale. It is called the "Venice of Portugal" and we could see why. As soon as we pulled into town we saw what we thought were gondolas parked in front of houses of interesting architecture (photos). Turns out the boats are not for gondola rides but are real working boats called moliceiros which go out to get seaweed (moliço) used for fertilizer. It originally was a seaport until 1575 when a storm sealed up the lagoon and it was not reopened to the sea until 1808. They have built many canals and bridges over them and it really is as close to Venice as I have seen. What a pleasant change to be back to Portugal in this charming and very livable little city. We walked around, had some ice tea, bought some Portuguese CDs and I did what I did in Scotland 2 years ago, I bought a new Casio watch. The replacement bands for the other one bothered me and the new one only cost $58. At about 5 PM, we drove a little east then south for 32 miles and up into the mountains to a special place in the National Park called the Forest of Buçaco (boo-sock-oh) (250 acres). When Napoleon tried to take Portugal in the early 1800s, his final shot was in 1810 when his general, Massena, marched 66,000 troops into this forest and were defeated by the Portuguese aided by the English under Lord Wellington. This was a decisive battle that kept Portugal independent. The area started as a monastic retreat in the 6th Century. To keep the monks out of trouble, the Pope banned women from entering the forest (which was walled in in 1622) and placed the trees here under his protection (excommunication if you damaged one). There is a 85 ft Cedar here planted in 1644 and some American Giant Sequoias. The Carmelites built a monastery here in 1628 which closed in 1834. King Carlos built a palace here in 1888 but never lived to see it finished. He and his son were assassinated in Lisbon in 1910. It is now a privately-owned hotel (photo) with beautiful azulejos depicting Columbus, etc (photos). It is a very peaceful and beautiful place to hang out. But we had to get back on the road and made the 28 mile drive to the old capital city of Coimbra. The first King, Afonso Henriques, moved the capital here from Guimeráes in 1139. He is buried here and the country's biggest and best university is the major part of the city. King Afonso III moved the capitol to Lisboa in 1250. The Romans started things here in the 2nd Century BC south of here and called it Conimbriga. They built a huge city with a forum and baths but the Swabians attacked it so many times in the 5th Century that all the people left and moved to present day Coimbra which at that time the Romans called Aeminium. 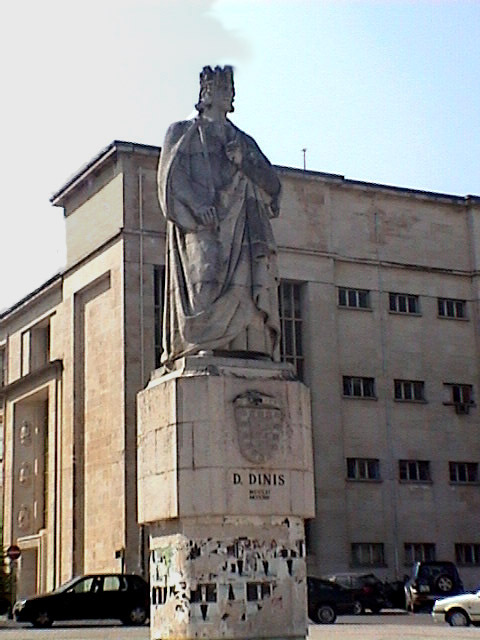 It was King Dom Dinis who decided to start the university (1290) and his statue sits in the center of the campus. We arrived at the Pousada dos Lagrimos at 7:30 and I had to run. I ran across the bridge over the Mondego River (photo) and then ran through the old streets of town which were not really lively at that time of night. By the time I got back we decided we had better eat at the Pousada (they don't keep dinner hours like they do in Spain) which we did and it was very good. Interesting note on the Portuguese currency, the escuda. When they write the amount, they do it like this: 12,000$00, using a dollar sign for a period. The way to convert to dollars is to change the sign to a decimal point, move the decimal point two places to the left and cut the amount in half. So the above is $60. Also things are not kept up as nicely and as spotlessly clean as they are in Spain (bathrooms for example), but they do have a lot of trash cans around also. Overall, Marcia feels the people are even friendlier than they are in Spain. Here, unlike Spain, some places do know what a cappuccino is and make them well. Others have no idea and bring you a cortado while others make it with whipped cream - it's a crap shoot each time you order. I got one that was fine but the foam was covered with nuts - yucca! Now this Pousada is very famous and here is how it got its name. Lagrimos means tears. After the death of his wife, who he was forced to marry, Prince Dom Pedro fell in love with her Spanish lady-in-waiting, Dona Ines (eye-nez) de Castro, who was living here when this was a convent. They secretly married to legitimize their children. His father, King Dom Afonso IV was turned against her by the nobles and he had her murdered here in 1355. Two years later when his father died, Pedro became king and had the murderers butchered (he personally ripped their hearts out of their chests with his bare hands.) He exhumed Ines' decomposing body, crowned her queen and forced all the nobles to kneel and kiss her hand. They are both buried together in the Monastery in Alcobaca (al-koh-bah-sa) to the south. This guy was really in love. Legend has it that a spring arose after her death on this property and it is called the Font de Lagrimos (photo) and the stream where Ines would pine for Pedro (photo) is called the Amores. Also, Lord Wellington slept here and signed the peace accord with France in this place. He also planted a giant Sequoia tree here at the time (photo). They have a goofy stone statue of Ines sitting in the lobby. Got to bed at 2 AM and woke at 11. I ran across the bridge again but the road to it had just been tarred that morning and in the heat it was grueling. Marcia met me at an Italian restaurant in the park by the Mondego. I changed and we went to tour the university which was interesting and visited the Machado de Castro museum with some fine paintings. We also visited the Catedral, the finest example of Romanesque building in Portugal. We finally headed out because I wanted to see the Roman ruins at Conimbriga but the GPS accidentally put us on the freeway and we whizzed past the exit and decided to skip it. I was really disappointed but Marcia said she has seen plenty of Roman ruins in Yugoslavia, Italy and England. Marcia drove the 55 miles south to the city of Fatima. It is here that the Virgin Mary appeared to three shepherd children on May 13, 1917. They were 10 year-old Lucia Santos and her two cousins Francisco and Jacinta Marta (photos on Basilica). The cousins are buried in the Basilica. Lucia became a Carmelite nun and is alive today at age 94. The Basilica was built in 1928. On the last day of the appearance on October 13th, there were 70,000 people there to watch the "miracle of the sun" but only Lucia heard the three prophecies Mary made and they were only given to the Pope to see. Each Pope since is the only one to read them. It is said that the 3rd prophesy was that the Pope would be assassinated. John Paul II placed the bullet that was in his chest in the Capela das Apariçoes, a little building built on the site where she appeared (photo). The field in front of the Basilica is twice the size of St. Peter's Square at the Vatican (photo). It is quite moving to see this place. We shopped around for a while. I have never seen so many religious statues (and good ones) in so many stores in one place in my life. It was getting late (7:30) so we finally headed out for the 92 mile drive (Marcia) south toward Lisboa (Lisbon) and then west to the little town of Sintra. What a story this place has.